Jordan was a former employee for some big bio-engineered theme park company. 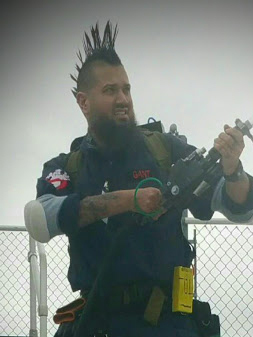 After many failed attempts to launch their unique theme park brand, Jordan took his engineering background and weird obsession with dinosaurs to join Ghostbusters NJ. His oddly specific knowledge of the DNA structure of certain dinosaur species already came in handy when the reanimated skeleton of a T-Rex was seen rampaging down 295 south heading towards the Delaware Memorial Bridge. Without Jordan on the GBNJ crew, Delaware would probably have been a total loss.